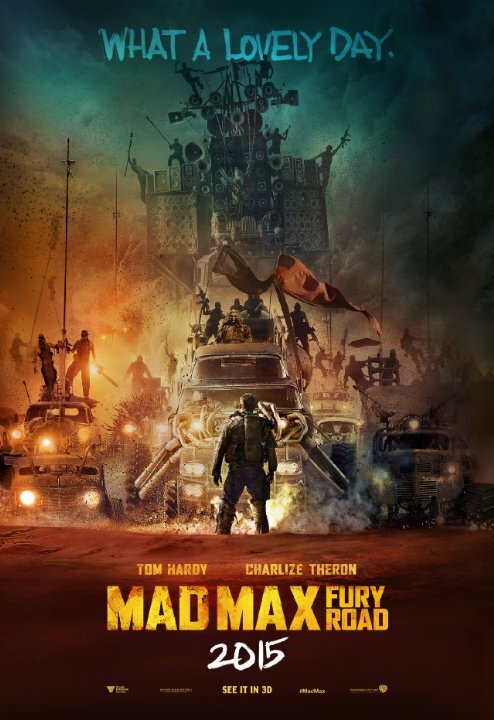 Mad Max: Fury Road – Did You See That One? In a dystopian and broken version of the world Max (Hardy) is looking for justice. He finds his opportunity when he joins Furiousa (Theron) in her attempt to find freedom in the land of her birth. It’s been 36 years since Mel Gibson (Braveheart) first brought Max Rockatansky to life. The original series featured three films, the last being released in 1985. So after more than three decades it fell on George Miller (The Witches of Eastwick) to bring the characters back to life. Miller was the director of the 1979 films, as well as the two that followed. This time he was brought on to direct, and also to assist Brendan McCarthy (Coneheads) and Nick Lathouris (Death in Brunsiwck) with the screenplay. The new film introduces Tom Hardy (Warrior) in the title role. The cast also includes Charlize Theron (Monster), Nicholas Hoult (About a Boy), and Hugh Keays-Byrne (Mad Max). If there’s a way to capture the experience of being shot out of a cannon within a screenplay, the writers of this film might have found it. The movie gets off to a frenetic pace after minimal setups. This allows the movie to work through a ton of action sequences mixed with the right amount of dialogue to tell the story. With such a wild start, I was initially concerned that the film might lack enough substance to stay interesting. I was relieved to find that the story told within the film is deep and thoughtful. This doesn’t mean that the action isn’t the main attraction though. While the dialogue is good, it’s the explosions and chase scenes that make this one tick. Much like the original trilogy, the story unveils only bits of the past which allows enough mystery to keep the characters interesting. This film has some of the more unique and wild characters that you’ll ever see in a film. The story works like a comic book with the quick flashes that seem to move the story in all directions. All in all, this is a wild ride. The actors had quite the challenge on their hands with this one. The characters are so eccentric and unique that the acting would play a huge part in how the tone of the film came together. Anything less than over-the-top would’ve undercut the visuals and the story itself. Tom Hardy does great work with his role in this one. His character is the least eccentric of the bunch, but it’s still a great lead for the film. Charlize Theron is equally impressive in her role as the determined and desperate Furiousa. These two anchor the story and create some great moments in the film. Another great addition to this film is the performance given by Nicholas Hoult. He’s not the boy from About a Boy anymore. This time around he’s a slightly insane young man with an affinity for action. This plays excellently throughout the film. Like Hardy and Theron, Hoult seemed to understand the intense nature of the film. After appearing in the first film in the series, Hugh Keays-Byrne was back for this one. Like the many other characters in the movie, his pushes the boundaries of logic. Altogether the cast seemed to understand the intense, weird, and awesome nature of the film. After you get into the film, the acting and the story play out in a fantastic visual spectacular. The cars are wild and exotic. The weapons are a combination of modern designs and medieval technology. The stunt work is some of the best you’re likely to see anytime soon. This movie takes the story and turns it into a wild ride that almost goes by too fast. Despite running two hours, the film seems to go by so quickly. This is also due to excellent editing and a tone that works within the faster pace. The film uses some impressive CGI to help enhance the action and build the world of the story. The music for the film is also impressively done. Junkie XL put together a raw sound with the score that both fuels and feeds on the energy of the story. The production work that went into this one pays off in all the right ways. This is an action junkie’s dream-come-true. The story is strong and the acting is stronger. The visuals simply allow the acting and the story to play out as it was intended to. This movie did all the right things with the source material and fans of the original trilogy should be thrilled with this new addition. This is an action film that’s best saved for older audiences. The violence can get intense, but it all works within the story. I would suggest this one to anyone who loves action or adventure. (I also hope to see a sequel to this exciting film.) I give this one 5 out of 5 stars. Pingback: The 2015 Summer Movie Season | Did You See That One? Great review. Who would have thought this would have been this good? Thanks! It definitely blew my mind. Pingback: The Devil’s Advocate | Did You See That One? Pingback: The Revenant | Did You See That One? Pingback: The Top Films of 2015 | Did You See That One? Pingback: Logan Lucky | Did You See That One? Pingback: Insidious: The Last Key | Did You See That One?